Angola Rising: African Folklore: Why Does the Lion Roar? African Folklore: Why Does the Lion Roar? 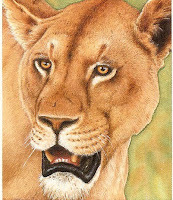 According to African folklore, the Lion became the most feared of the predators. In these early days, Lion still had a gentle voice, not very loud at all, and so he was able to catch and eat the other animals without much trouble. This, of course, greatly worried the other animals, since they never knew when Lion was on the hunt. They decided to hold a meeting to find a way of somehow making Lion less dangerous. They talked for a long time, but none of them could think of anything. The other animals all agreed that this was a marvelous idea. But how was Hare going to manage such a thing? Hare just winked and set off on his difficult task. Eventually Hare found Lion resting beneath a shady umbrella tree, and approaching him carefully,saying, "O Great One, I am truly most unhappy to bring you bad news, but your brother is very ill, and requests to see you at once:' Lion was dreadfully upset to hear this news and told Hare to lead him to his brother as fast as possible. Hare took lion for miles and miles around the Bushveld and after several hours lion (who, after all, had been disturbed during his morning sleep) was so weary he could go no further, He lay down in a shady spot and slept. Now,with the help of a honeyguide bird, the crafty Hare found a wild bees' nest in a tree not too far away. After following the required custom of leaving a good piece of the honeycomb as a "thank-you" for the little bird, Hare took some of the honey and dribbled it all over the paws and head of the sleeping lion. Hare then ran off to some thick bushes nearby and hid. lion was stung so many times and was in such pain that his soft cries soon swelled to a thunderous roar that could be heard for miles around!